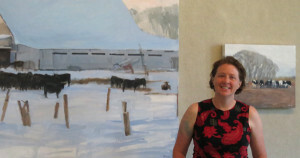 I am an American Artist painting the landscapes, animals, and people of South Dakota and the greater Midwest. I paint the landscapes of Minneapolis, MN, Sioux Falls, SD, and other parts of Western Minnesota, Eastern South Dakota, and beyond. Many of my collectors used to live in Brookings or the Midwest, and want to take a piece of the landscape with them to their new environment.Collectors in over 30 states (including California, Maine, Texas, Florida, Washington, Minnesota…), as well as Canada and Ireland, have purchased my portrait paintings, landscape paintings, and flower paintings. In art school I loved drawing and printing. Line quality was (and still remains) a major focus and interest. I drew and painted for the next 18 years. In 2007 I began my journey to becoming a full time professional artist. At first I painted small still life paintings of small objects with emotional importance, as well as portraits of moms and babies. Over the next several years I painted moms (and occasionally dads) and babies from 30 states. Now my work has become much larger. I now paint the people, land, and animals of the Midwest. I am fascinated with the invisible, but a very tangible connection between people who care for each other, between animals, and between us and the land. If you love a painting listed on this site, you can purchase it through the gallery listed on that painting’s page – or by clicking the Add to Cart button. If you would like to commission a portrait or other painting, just email, call or text me and we can talk about your project. South Dakota has purchased Jessie’s work for the public collection in Pierre, and Sanford hospital has purchased her work for the Edith Sanford Breast Center and the Memorial Garden in Sioux Falls, SD. She is represented by the South Dakota Art Museum shop, SouthWind Gallery in Topeka, KS, and Art Resources Gallery in Minneapolis, MN. More fine art, multimedia and science classes and workshops than I can count. I teach occasional workshops out of my studio, or in other locations by invitation. Sign up for the newsletter to be notified about workshops. At PNCA the (now) late printmaker Gordon Gilkey was my mentor and was incredibly inspiring, and I adored him and his passion for prints. He had a great collection of prints which I believe he donated to the Portland Art Museum. He let me hold an original Picasso print on one of our adventures perusing his collection. He handed the print to me and at one glance I knew what it was… I remember the sensation of holding something so special. Ken taught me about animation, but most importantly told me to work at my art every day. Stan Miller is an amazing watercolor artist. He taught us about the difference between composition for selling artwork and composition for competitions. And he taught great techniques for getting good values and handling the medium. Anna Youngers charcoal portrait drawing workshop focused on accurate drawing and values. She allowed us to really slow down and spend 3 sessions on the same drawing, which I found very liberating.